This paper sets out some very straightforward evidence that many anomalies (strange or inconsistent events) in the course of World War Two, which cannot be explained by conventional historical analysis, can be fully understood if we recognise that the same people controlled both sides. These people are the Global Elite or Illuminati. They brought about and controlled the First and Second World Wars and, after a period of consolidation, are on the point of starting the final phase of their plan for global reconstruction, namely World War III. Following the horrors of that awful event they intend to impose their New World Order. Here are just 20 anomalies from World War Two. Many more examples could be given. 1. Why didn’t Hitler commandeer the French fleet? France signed an armistice with the Germans on 22 June 1940. The armistice stipulated that the French fleet would be largely disarmed and confined to its harbours, under French control. This was an astonishing concession from the victorious Germans. Had Hitler commandeered the French fleet, he would have had overwhelming naval superiority in European waters. What is even more extraordinary, he made little attempt to prevent the British from scuttling the French fleet in three operations – Mers-el-Kebir (July 1940), the Battle of Dakar (September 1940), and the Battle of Toulon (November 1942). The Global Elite wanted major confrontations on land only. The outcome would be much easier to control and would ensure massive loss of life, unlike engagements at sea. The war would have swung too much in Hitler’s favour had he secured the French fleet. 2. Why didn’t Hitler close the Straits of Gibraltar? This is related to Question No.1, but deserves to be addressed in its own right. One would expect the Germans to be anxious to reduce Allied activity in the Mediterranean. This could be achieved very simply by sealing the Straits of Gibraltar. So why did Hitler make no reasonable attempt to do so? Again, the Global Elite wanted to prolong the war as much as possible but to end with a German defeat. If Germany sealed the Straits, she would have been too secure on her western front. Historians have also argued that she should have closed the Straits in order to strengthen her control of the eastern Mediterranean and thereby facilitate her access to oil in the Caucasus. However, in reality, she didn’t need the oil – see the next question..
3. Where did the Nazis get all of their oil and fuel? Germany fought a major war on two fronts for several years, while squeezing maximum output from her economy. During this period she massively boosted the production of armaments. And yet she had no indigenous oil reserves. So where did she secure her oil? The conventional answer is that she converted her coal and lignite deposits into oil. If you pause for a moment to reflect on this alleged solution, you will see how ridiculous it is. Oil produced by this process is of poor quality, with a low octane content. 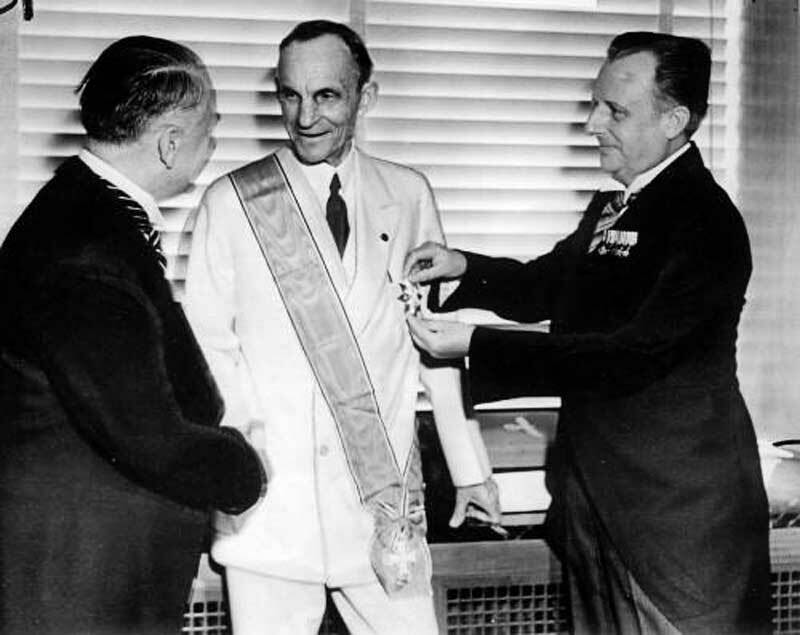 The conversion process itself is very energy consuming, and the quantities produced would not be nearly enough to meet the enormous demands of a two-front war and an economy firing on all cylinders.The Global Elite ensured Germany received a steady supply of oil for the duration of the war. This was shipped to Spain from the US by Standard Oil and then piped into German-controlled France. 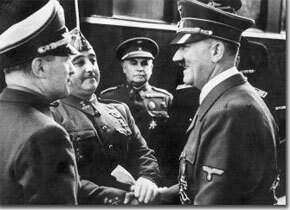 Even though Spain remained neutral throughout the war she was, with Franco at the helm, a silent ally of Germany. 4. Why did Hitler order a pause at Dunkirk, letting the British escape? The German army had the massive British expeditionary force at their mercy at Dunkirk in May 1940 but, on Hitler’s direct orders, held back for three days, thereby enabling 338,000 British and French troops to escape. The German generals, awaiting approval to launch a full-scale assault, were horrified. As military blunders go, this was one simply inexplicable by conventional standards. The truth, however, is very straight forward. The collapse of Britain was not part of the plan. The Global Elite were aiming, rather, to create upheaval in Eastern Europe, and to demoralise France and destabilise Germany so that the entire region could be re-moulded into a ‘united states’ of Europe – the European Union. Britain could not be invaded since she was needed to spearhead a counter-thrust from the west after Germany became entangled in Russia. 5. Why did Hitler prosecute the Battle of Britain in such a half-hearted manner? 6. Where did the Nazis get the money to finance their massive re armament programme? The Nazis had to build up the German economy in order to reinforce the popular perception that they offered strong, effective leadership. This meant providing the population with both standard necessities and a range of luxury items. On top of this, they had to undertake a massive programme of rearmament – building planes, ships, tanks, artillery, and an extensive military infrastructure. This had to be achieved in a very short time frame. For any modern economy this would have been a major achievement, but for one on the brink of bankruptcy, it was a miracle – unless of course they received a substantial influx of foreign capital. Just as foreign bankers funded the Russian Revolution and kept the Bolsheviks solvent for many years, they also funded the rise of Hitler. Furthermore, they provided significant technological assistance to ensure that the German programme of rearmament got up to speed as quickly as possible. 7. How Did the Soviet Union Develop a nuclear bomb so soon after the Americans? The Manhattan Project, under which the US developed an atomic bomb, required a huge capital investment, the use of leading edge technology, and the very best physicicts and engineers in the US and Europe (including a host of Eastern European scientists). The Soviets had none of this. They were backward technologically, devoid of capital for investment, and sorely lacking in the scarce technical know-how needed to design a workable nuclear device. So the West provided the necessary scientific information and capital around 1945/46. Even with this substantial financial and technical assistance it still took the Soviets nearly five years to finally build and successfully detonate their first nuclear device. The Global Elite, who secretly ran both countries, deliberately created an ‘arms race’ between the US and the Soviet Union. This artificial enemy ensured that world politics would be driven in the main by strategic military considerations, in particular the threat of nuclear annihilation or mutual assured destruction (The Cuban missile‘ crisis’ was a cunning ploy (a) to reinforce the popular belief that mutual assured destruction was a real possibility and (b) to keep Cuba completely off-limits to Americans until it could be used for its original purpose – a staging post for the invasion of the US during or prior to World War III). In this way they could create the global institutions that would be needed as a springboard to a One World Government. These included the United Nations and NATO, as well as a number of lesser institutions which transcended national sovereignty, such as the FAO, WHO, UNESCO, IAEA, IMF, World Bank, and in due course the European Union – the principal model for the coming One World Government. 8. Why were so many Japanese cities (around 67) savagely firebombed? Most westerners are unaware of the extent to which Japanese cities were devastated by the Americans in World War II. All attention has focused on the two cities destroyed by the atomic bombs, while the savage fire-bombing of around 67 other cities has gone largely unnoticed. Firebombing entails the use of large incendiary devices to create a massive conflagration in densely populated urban areas, leading to a huge loss of civilian life. The most intense firebombing took place in the period 9 March to 15 August 1945.The firebombing of Tokyo alone, over the 2-day period 9-10 March, killed an estimated 100,000 civilians. A huge proportion of these were women and children. It has been estimated that some 500,000 civilians were burned to death in fire bombing raids on Japanese cities over this period, more than half of whom were women and children. Other than blunting Japanese morale, these killings served no useful military purpose, but in occult terms them were of immense importance. The sacrifice of children by fire is the most potent Satanic ritual. The worship of Moloch is perhaps the best known example of this hideous practice. The immolation of these children, along with their mothers, was a deliberate and systematic series of occult sacrifices – terror in its pursest form. Today it is very difficult to obtain accurate information about this appalling war crime, or even a breakdown of the numbers killed. The official line amounts to little more than a cover-up. 9. Why did Roosevelt impose an oil embargo on Japan in July 1941? One of the best ways to provoke a country into war is to cut off its energy supply. This is what Roosevelt did in July 1941 when he imposed an oil embargo on Japan. The Japanese depended on the US for 80% of its oil imports (At that time the US was a major oil exporter). The Americans increased the pressure by imposing a steel embargo at the same time. These twin embargoes caused a crisis in Japan and virtually forced them onto a war footing with the US. Roosevelt and the Global Elite wanted a major war with Japan. Victory (which was assured) would give the US an unassailable foothold in Asia. It would also draw the Japanese out of China and hand control of that vast country to their socialist puppet, Mao Tsi Tsung. Both countries were deliberately devastated over this period – by World War II itself, the Sino-Japanese conflict and the Chinese Civil War – thereby allowing the Global Elite to shape them exactly as they wished over the ensuing decades. This, in effect, was an early phase in the creation of a New World Order (An even earlier phase had been achieved with their take-over of Russia in 1917). Apart from a very small interruption, Japan has been ruled by a single party ever since, just like Singapore. Following the devastation of Korea, Vietnam, Laos and Cambodia, and the installation of strong dictatorships in countries like Indonesia and Taiwan, virtually the whole of Asia now marches in step with the dictates of the Global Elite. India was already under their control – the hand-over of 1947 was purely for show. Notice the way they work – smash and reform. They devastated Russia in order to shape it according to their will. Then they devasted Japan and China, Germany and Eastern Europe. Next came Korea, Vietnam and Cambodia. Their philosophy is very simple – crush, devastate and rebuild. The next major country on their list is the United States. 10. Why did the Americans leave Pearl Harbour so poorly defended? Once the logic of #9 above is understood, the reason for Pearl Harbour is perfectly plain. It was deliberately engineered to create outrage among the American public and win their support for America’s entry into the war. Up to then, the American public was totally opposed to any involvement in the war. Roosevelt betrayed them, just as Woodrow Wilson betrayed them in World War I. 11. Why were the main US vessels removed from Pearl Harbour just prior to the Japanese attack? The Americans wanted a major calamity at Pearl Harbour, but they did not want to lose their best ships. So they simply removed them to the open ocean before the‘ surprise’ attack. 12. 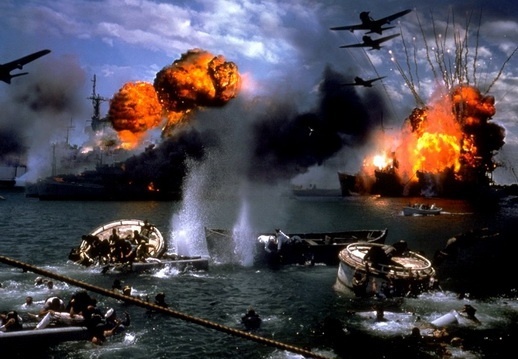 Why was a professional Movietone cameraman available and ready early on a Sunday morning to record the Japanese attack on Pearl Harbour? Incredibly, the Americans had colour movie footage of the Japanese attack. Even though the ‘surprise’ attack took place early on a Sunday morning, a professional Movietone cameraman, Al Brick, was in place to record this historical event. As intended, the footage would later prove invaluable as a propaganda tool in American cinemas (via the Movietone newsreel, Pearl Harbor - Now It Can Be Shown, January 1943, and the John Ford documentary re-enactment, December 7 , which included some actual footage of the attack). 13. 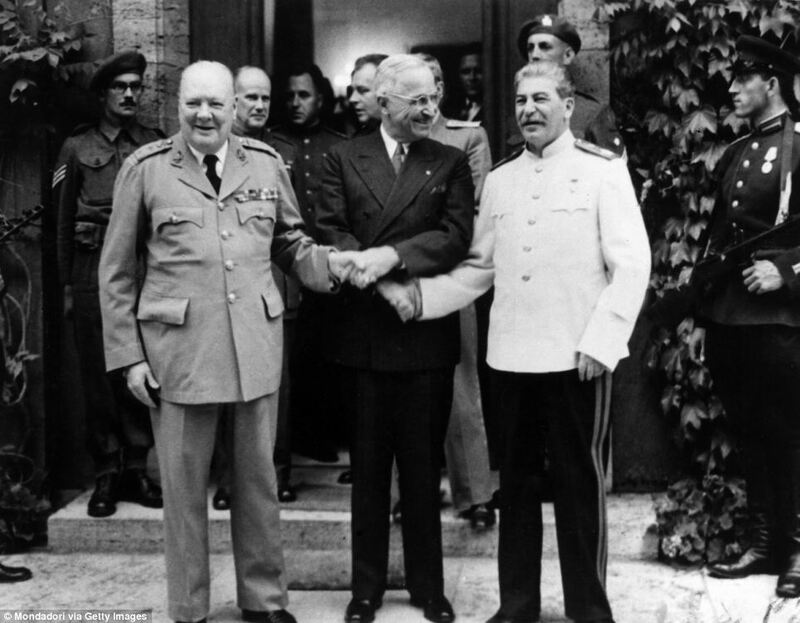 Why did Churchill and Truman agree to the enslavement of Eastern Europe by the Soviet Union? 14. Why did Churchill order the return of 45,000-50,000 Cossacks to the Soviet Union after the War, knowing Stalin would kill them all? During the War, a large number of Soviet POWs, who were always opposed to the Stalinist regime, offered to fight alongside the Nazis. Most of these were ethnic Cossacks or similar groups persecuted under communism. The western powers forcibly repatriated these Cossacks to the Soviet Union, knowing full well that Stalin would kill every last one of them, either by execution or by working them to death in labour camps – which he did. A few escaped to tell the tale of these awful atrocities. Modern historians estimate that between 45,000 and 50,000 Cossacks were murdered on foot of this western betrayal. If the western powers were the ‘good guys’, then this would never have happened. But when one understands that the entire course of the War was dictated by a Global Elite, then this horrendous outcome is actually quite consistent with their bloody agenda. Indeed, it would be surprising if they passed up the opportunity to quietly butcher 50,000 people, most of whom were Orthodox Christians. 15. Why did Churchill order the repeated firebombing of several German cities? By now, the reason for this should be fairly obvious. This vicious and sadistic campaign, which served no useful military purpose, traumatised the local population, leaving them so shocked that they would be easy to manipulate and control after the war. They also constituted a series of massive human sacrifices to Satan, notably the burning to death of thousands of children. The same bombers could have been ordered to bomb the factories of Krupp and IG Farben, or the German rail network, or the German supply lines to the eastern front, or German military bases, or German airports, or the German road network, or German shipping and ports. But no. The incineration of thousands of women and children took precedence. The Illuminati ‘Shock Doctrine’ was well and truly at work in this ghastly enterprise. 16. Where did the Nazis get their Ford and GM trucks and the large number of Hollerith machines to help them manage the roundup of Jews and dissidents? Many historians marvel at the efficiency with which the Nazis tracked and documented the Jewish population. Yet none of them can explain where the Nazis obtained, under wartime conditions and a strict trade embargo, the large number of Hollerith machines (produced by IBM) which were needed to underpin their brutal efficiency. The truth is that several major American companies continued to supply essential equipment to the Nazis after the declaration of war with Britain in 1939.Through its factories in France, Ford Motor Company produced a steady supply of trucks to the Nazis for use in its campaign on the Eastern front. General Motors did the same through its wholly-owned subsidiary, Opel. Where necessary, machine tools and other essential parts were imported from the US.A report of the US Senate Committee to the Judiciary, 1974, stated: On the ground, GM and Ford subsidiaries built nearly 90 percent of the armored "mule" 3-ton half-trucks and more than 70 percent of the Reich's medium and heavy-duty trucks. These vehicles, according to American intelligence reports, served as “the backbone of the German Army transportation system.”...While the number of trucks and other vehicles supplied in this way is difficult to estimate, it is clear from this Congressional report that it was very substantial. Given that the Nazis were heavily dependent on horses to support their supply lines at the start of the War, this assistance was invaluable.